I didn’t sleep well last night. Having put myself to bed at a reasonable hour, I spun in fitful sheet-tangles trying to find that just-right bodily pose that would release my mind to dreamland. But dreamland itself proved fitful, with vividly distressing dreams from which I woke-wide around 4 am. I finally fell back asleep, hard, just in time to greet this groggy day. Somewhere in the night, as the stress bogeys pressed in hot and heavy, my brain produced this lovely, lilting line from Hamilton as a prayerful antidote. It played on a loop and stays with me today. I have not been a political person. In part because I don’t like conflict, but also because I generally don’t feel confident to speak on political issues. My heart directs me toward encouragement rather than confrontation. I didn’t sleep in part because I haven’t been writing. I haven’t been writing because I don’t know what to say in light of all the literal and figurative whirlwinds decimating our beautiful world. Gun control laws need immediate and serious revision. Private citizens of sound mind who have passed a background check may have their guns, but private citizens don’t need silencers and automatic weapons. Puerto Ricans are Americans struggling for survival and need all the help the U.S. can provide. If you would expect your country to help you in time of disaster, then you should demand as much for them. Kneeling is a peaceful and prayerful pose. Kaepernick et al. aren’t protesting the flag but police violence against people of color. They aren’t disrespecting the military or our country but using their First Amendment freedom and position of power to shine a spotlight on injustice. Like Jesus, who used His power to get down in the dirt with those who suffered injustice. Global Warming is not fake news but a scientifically proven reality, and the EPA and our National Parks need protection. Giving tax cuts to the rich and stripping health care from the poor makes no sense. We need bridges more than walls, and taco trucks on every corner would be down-right delicious. October 4 is National Taco Day, and I strongly recommend you try my new fav taco recipe. The original recipe comes from a partnership between the Sarno brothers at Wicked Healthy and Purple Carrot, a plant-powered meal prep company. I first heard about Chef Chad Sarno through UC Davis Department of Integrative Medicine (follow their blog for great information about nutrition and plant-based eating). And friends have shared rave reviews of Purple Carrot. Though I don’t need a meal prep service at this point, I am grateful that they are willing to share their recipes. For the original recipe they made tostadas with mango salsa. I dropped the salsa and added jalapeno; and tostadas or soft or crispy tacos, any way you serve it, this recipe = delish! Combine lentils and water in a saucepan. Bring to a boil, cover, and reduce heat to low until water has been absorbed, about 14-17 minutes. The lentils should become soft and porridge-like. If necessary, use a potato masher or fork to mash them, and stir in the lime juice. If you’re making tostadas, preheat the oven to 400 and toast tortillas for 10-12 minutes. In a large skillet, saute onions for 3 minutes. Add garlic, bell peppers, and jalapeno and continue cooking, stirring occasionally, for another 5-10 minutes until veggies are soft and carmelized. To serve, add lentils to tortillas or taco shells and top with fajita veggies, cabbage/lettuce, avocado, and cilantro. If you have lentils left over, reheat with a drizzle of oil and more lime juice. We are indeed lucky to be alive and, look around, we are alive right now. Let’s eat more tacos, kiss one another’s boo boos, love and protect each other and our world, and do something each day to make life on earth a better place for everyone. 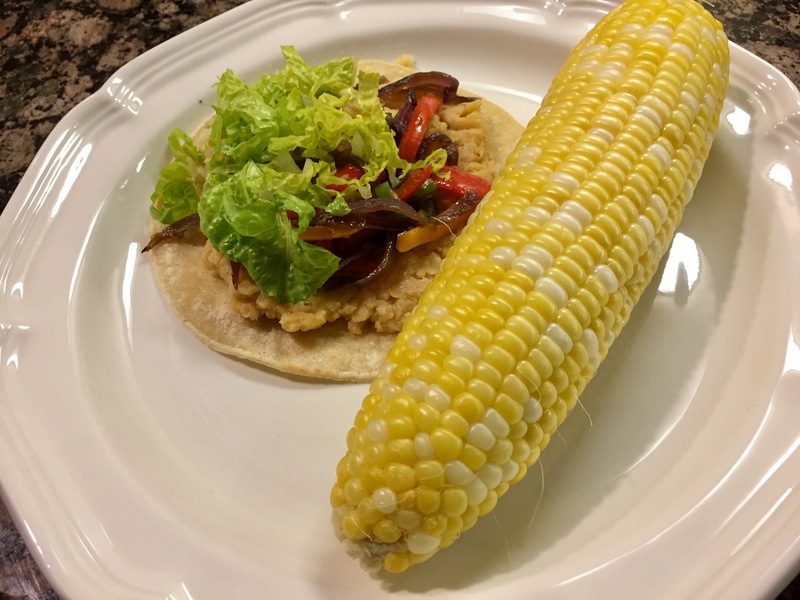 This entry was posted in cooking, Uncategorized and tagged freedom, Hamilton, Kaepernick, politics, Purple Carrot, tacos, take a knee, UC Davis Department of Integrative Medicine, Wicked Healthy by Milagro Mama. Bookmark the permalink. Go Siv! Shout the truth whenever you feel the need!